The greatest hits of the passing month in HEP were the Higgs update from the LHC and the release cosmological results from Planck. But winter conferences is quite generally the time for experiments to dump new results. Here's a short summary of the recent important announcements that might have escaped you in the general turmoil. 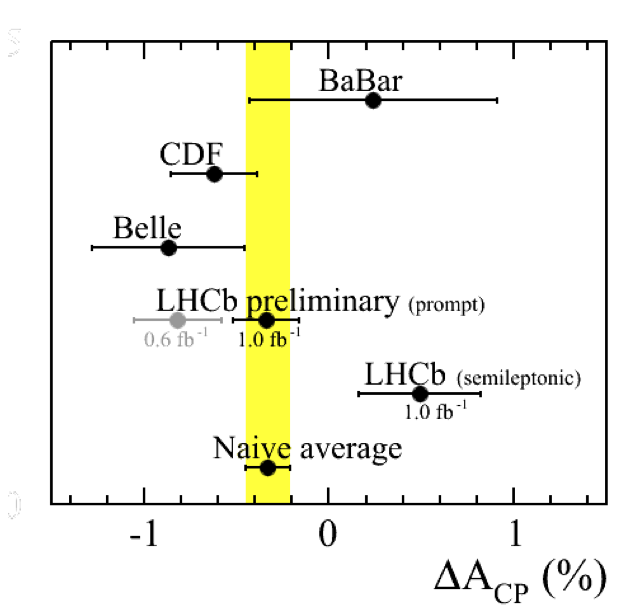 A year ago LHCb surprised everybody with an evidence for CP asymmetry in D meson decays. More precisely, they measured the asymmetry between the D0→π+π- and D0bar→π+π- decay widths, and also between the D0→K+K- and D0bar→K+K- widths, finally quoting the difference ΔAcp between these two asymmetries so as to reduce systematic errors. Although the standard model prediction for this observable cannot be reliably calculated with present techniques, more or less informed estimates locate the asymmetry in the 0.01-0.1% ballpark. 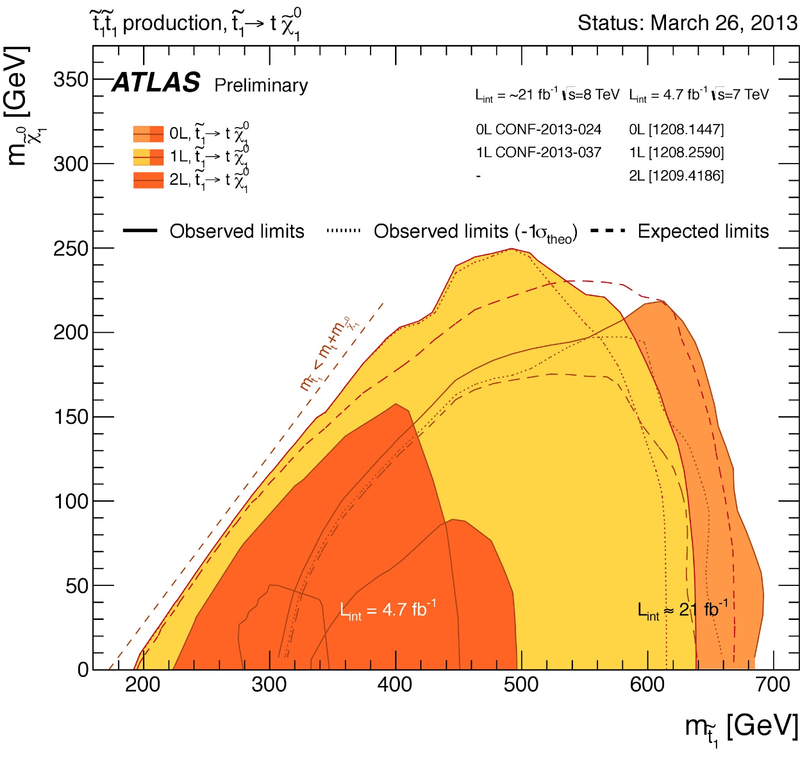 The previous LHCb result was ΔAcp=(-0.82±0.21)%, which prompted some cautious talk of new physics. 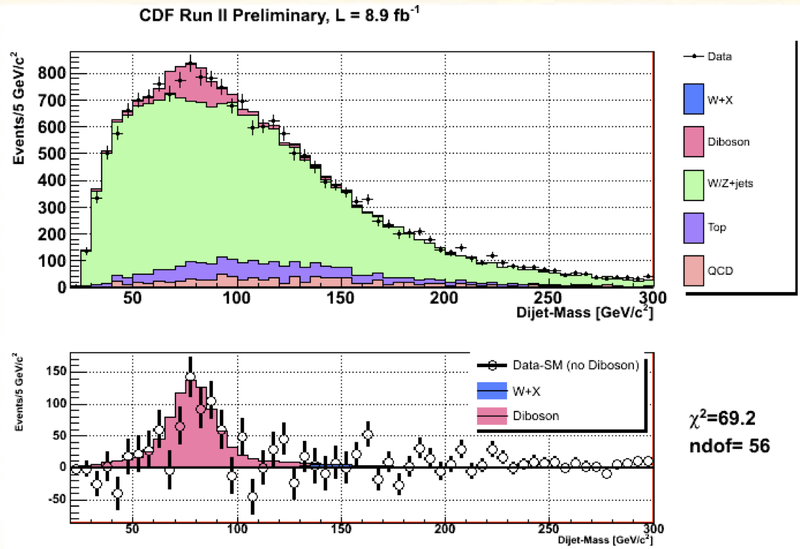 The recent update LHCb not only takes advantage of the increased s tatistics (from 0.6 to 1fb-1), but also adds a new category of events where the flavor of the initial-state D-meson is tagged using the muon from the semileptonic B decay that decayed into a D-meson (see the diagram on the right-hand side of the picture, only the prompt category with the pion tagging was used in the previous analysis). The new LHCb result is a dramatic U-turn. The asymmetry in the prompt category went down to ΔAcp=(-0.34±0.18)%, while the asymmetry in the semileptonic category is measured with the opposite sign: ΔAcp=(0.49±0.33)%. 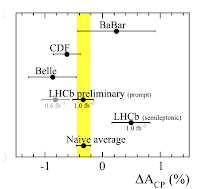 The naive average of the 2 results yields ΔAcp=(-0.15±0.16)%, which means that not only the hint of new physics but also the evidence for CP violation in the D-meson sector have been completely wiped out. For a detailed description of the analysis see here and here. In fact, in March we witnessed a real chainsaw massacre of hints of physics beyond the standard model: Neff in Planck, h→γγ in CMS, ΔAcp in LHCb, and finally the 145 GeV dijet bump at the Tevatron have all gone away. The last one is actually a pleasant surprise. Recall, that 2 years ago CDF found a dijet bump near 145 GeV in events featuring a W boson and 2 jets with the significance larger than 4 sigma. If confirmed, the bump would mean a new particle at the weak scale: maybe a hadrophilic Z' boson, maybe a technipion, etc. But D0 did not confirm the bump, and there was a danger that the disagreement between the Tevatron experiments would never be resolved. Moreover, testing this anomaly at the LHC will probably never be possible due to an overwhelming standard model background of W+jets events. It seemed that we would have to live with this ghost forever. Luckily, CDF went back to the analysis and found a bug. The main culprit seems to be a difference in the detector response to quark and gluon jets, not taken into account in the previous analysis. Also, CDF improved modeling of the multijets background where one of the jets fakes a lepton from W boson decay. Once these improvements are included, the 145 GeV bump vanishes completely. One less thing to worry about. 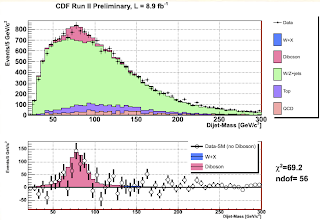 More importantly, the fact that CDF now understands well the W+jets spectrum adds some more confidence to Tevatron Higgs searches which rely in part on similar analysis techniques. μ → e γ from MEG. On the precision front, there was an important update from the MEG experiment which searches μ → e γ decays. The standard model predicts this decay should be too rare to be observable (a tiny branching fraction is induced via the neutrino mixing). On the other hand, it is straightforward to produce a large branching fraction in models with new sources of lepton flavor violation, including supersymmetric and composite Higgs models. The latest MEG update sets the limit on the branching fraction at 5.7x10^­‐13 at 90% CL, which represents a factor of 4 improvement of the previous limit. In any case, precision measurements of rare SM processes seem to be the most promising way to go ahead for particle physics. Indeed, our options to increase collider energies are very limited, whereas in many areas precision can be improved by orders of magnitude at a much lower cost. The hope is that one of these days one of these experiments will observe a non-standard process which will give us a clue about physics beyond the standard model. Searches for supersymmetry no longer provoke a nervous anticipation, rather a weary frustration at the more and more stringent limits. 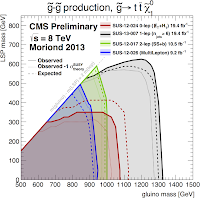 Two important updates using the full 8 TeV dataset came shortly before the Moriond conference. One is from ATLAS searching for direct production of stop pairs, where each stop decays to a top quark and an invisible neutralino. The limit on the stop mass is almost 700 GeV, except in the kinematic region where the sum of top and neutralino masses is very close to the stop mass. 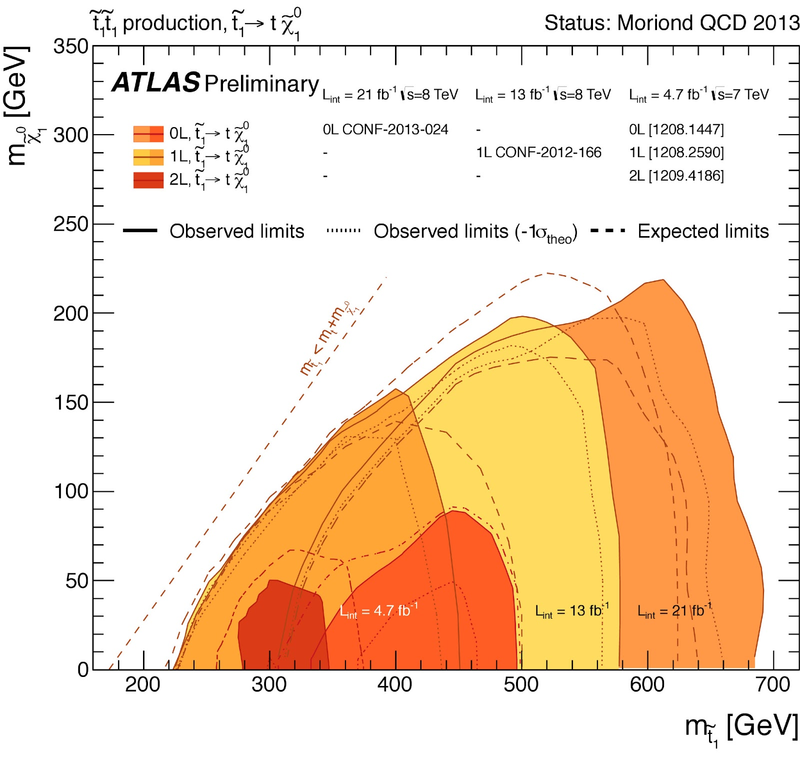 Another important update is the CMS search for pair production of gluinos, where each gluino decays via an off-shell stop to 2 top quarks and an invisible neutralino. 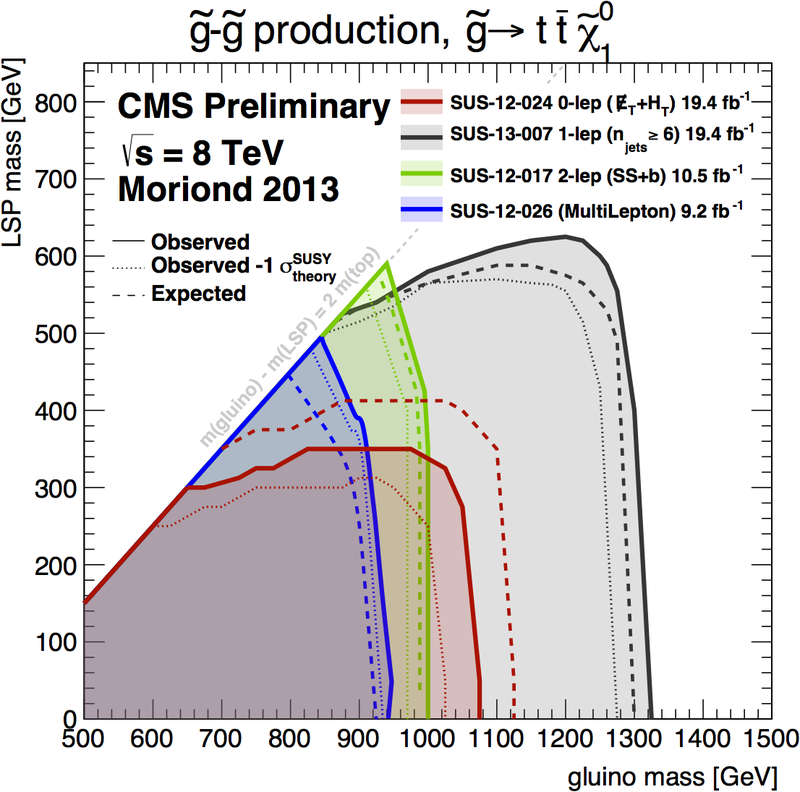 In this case, the limit on the gluino mass reaches 1.3 TeV. The limits may be somewhat improved in the future by including more channels, but they already give the feeling of the final reach of the 8 TeV LHC. The two searches mentioned above are important for theorists because they probe the presence of stops near the TeV scale, which is the necessary condition for supersymmetry to address the naturalness problem of electroweak symmetry breaking. Taken together, the SUSY results gradually force us to accept that supersymmetry cannot completely explain naturalness; even if it's just behind the corner it is getting more and more in difficult in most realizations to avoid fine-tuning at the 1-10% level. See here for more details of the CMS and ATLAS analyses. Hrm, I constantly make fun of people who believe in these lame hints of BSM, but I kinda sorta believed in the Wjj bump. How embarrassing! Shame on me. It makes you wonder how many other systematic errors fly under the radar because they don't pop up in anybody's favorite BSM channel. Please explain it like I'm 5, 50 or "slow" - ignoring religious nonsense, why is fine-tuning to be avoided at all costs? Victor Stenger wrote a compelling argument as to why the Universe is not really fine tuned for our existence. Can't the same argument be extended towards the naturalness problem? Thanks for the CDF paper reference - it includes excellent detail on how detector and Monte Carlo results are analysed and calibrated in general, plus I had been waiting for the explanation of last year's puzzle. thx, i fixed the links. I have a comment on the stop searches. "The limit on the stop mass is almost 700 GeV, except in the kinematic region where the sum of top and neutralino masses is very close to the stop mass." Actually the stop could also be lighter than the top+neutralino masses, leaving a much larger kinematic region open.